Bonus items in video games are almost always hidden behind some array of dangerous obstacles. On first play, most people would avoid them. The primary goal, after all, is to complete the level. But when you immerse yourself in the virtual world for long enough, you begin to see the obstacles as goldmines. You know that the only reason that lava pit, or wall of bees, or freakish baddie is there is to guard the prize on the other side. Maybe the first time you found one was on accident, when you lost control and saw the prize on the other side as you were falling to your death. So you went back. Your instincts began to invert themselves. Now, instead of running away from harm, you plow straight into it. You sacrifice your health based on some kind of faith that, once you break through, whatever is on the other side will restore you and give you powers you never knew existed—strength that will make the obstacles you once feared seem benign. This entry was posted in Musings, Nerdy, Video Games, WIN and tagged bonus levels, donkey kong, winning on June 2, 2014 by Arikia. This entry was posted in Hell Yes, Nerdy, Sciencey, WIN and tagged giant squid, Kraken, Kraken rum, seapunk, Squid party, squid screening, The Life Aquatic on January 28, 2013 by Arikia. Can you spot the IT Consultant? This entry was posted in LOL, Nerdy and tagged Hilarious stereotypes, IT Consultant on June 1, 2010 by Arikia. In honor of Pi (AKA 3.14159265358979323846264338327950288…) Day, I had to visit my old friend Frank the Science Punk‘s site and dig up this video. It is pretty much the most epic video about Pi ever made, ever. This entry was posted in LOL, Nerdy, Videos and tagged Harn n' Phirm, Pi Day on March 14, 2010 by Arikia. To commemorate the fact that there is only one month to go until I get to see all my favorite people from the Internets, some of whom I will be meeting for the very first time IRL (!!! 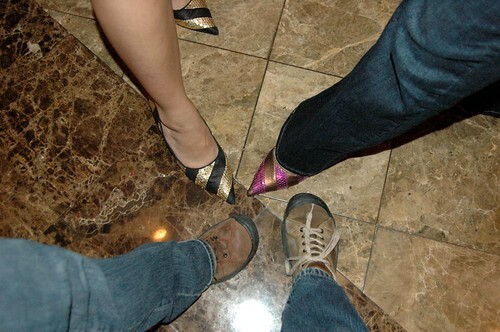 ), I present to you my favorite picture from ScienceOnline2009. Image 1: The Hot Shoes of Science. From the top left we have my own hot legs in the gold and black Naughty Monkeys, Scicurious (my ScienceOnline2010 roommie!!!) of Neurotopia‘s hot legs in the purple and gold Naughty Monkeys, ScienceWoman‘s and Alice’s hot legs in the brown… I don’t know what you call those things but they both looked very becoming in them and I adore them very much. The ladiez, notsomuch the shoes — FOR ME. OK I’m going to stop talking now, and start getting excited about ScienceOnline!! This entry was posted in Fashion, Hell Yes, Nerdy, ScienceOnline and tagged hot legs, hot shoes, NaughtyMonkeys, science women, ScienceBlogs, ScienceOnline, scienceonline2010 on December 14, 2009 by Arikia.